The MA Sustainable Design students will be showcasing their work in Brighton this Bank Holiday weekend. The exhibition, at Werks Central in Brighton, is designed as a series of workshops highlighting issues connected to sustainability, its impact on Brighton and its wider context. It may help to demystify what Sustainable Design is all about and how design can seek to engage with complex and critical issues relevant to issues of sustainability and planetary health. 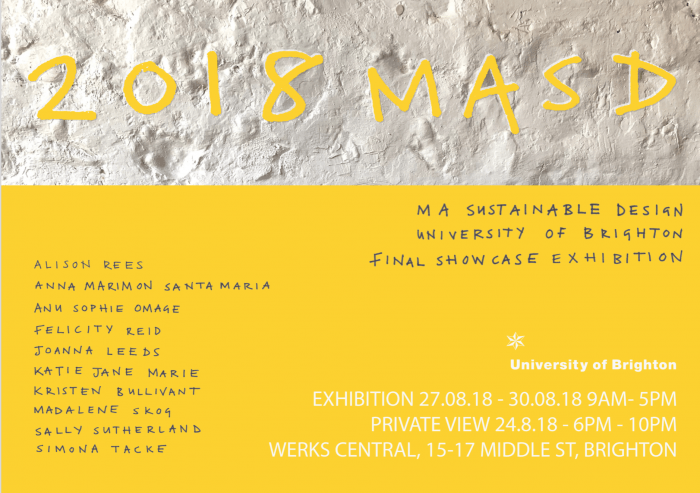 Ten students will be exhibiting, and the projects on show cover subjects including food, education, climate change communication and material futures. The exhibition will run from Monday 27th August until 30 August and is open 9-5 from Bank Holiday Monday 27th August until Thursday 30th August. The private view is on Friday 24th August 6-10pm. This entry was posted in Design and craft, Postgraduate, What's on and tagged Werks Central.